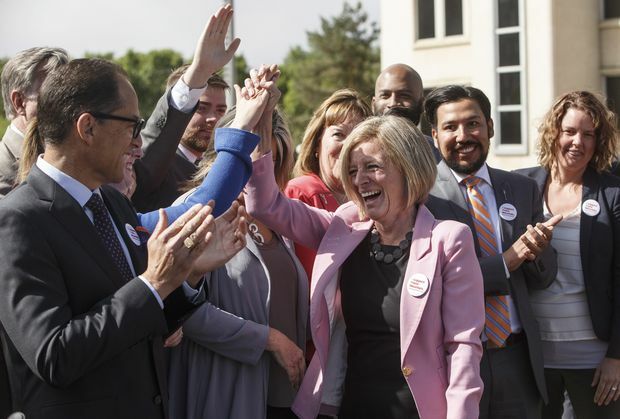 Alberta Premier Rachel Notley is applauded by her caucus members Tuesday. Rachel Notley has steadfastly insisted that politics and her party’s chances in the next provincial election are not in her thoughts as she has led Alberta’s push for the Trans Mountain expansion. But there is no doubt the project will be on the minds of voters: With the election less than a year away, the pipeline issue is one a majority of Albertans identify as top-of-mind and as closely connected to the health of the provincial economy as a whole. And while Ottawa’s extraordinary step this week to announce its intention to buy the pipeline and expansion project for $4.5-billion doesn’t stop fierce environmental opposition – or even provide total certainty the project will be built − the move does give Ms. Notley’s NDP a fighting chance for re-election. She celebrated this week with a news conference on the legislature grounds, where she high-fived and hugged her cheering caucus members. However, it’s still an uphill struggle for her party. The Premier’s closest advisers acknowledge the NDP – which has governed through three years of lower oil prices, recession and high unemployment − trails the United Conservative Party (UCP) in polls by 15 to 20 percentage points. But according to the party insiders, the party now has three legs to stand on now when it comes to making a pitch to votes. First, a slowly improving economy. Second, major progress on the pipeline expansion. The third element that the NDP is counting on is that voters don’t completely trust UCP Leader Jason Kenney on social issues. And Ms. Notley is also enduringly more popular than her own party, which hopes her leadership can help them make up ground, and attract women and minority voters, in the next election’s main battleground: Calgary. The NDP electorate is not people who get up in the morning passionate about pipelines and energy. For his part, Mr. Kenney has said he is not going to stand in the way of the “faint hope” of getting a coastal pipeline built, but he said federal ownership only moves the risk to taxpayers. Even if federal ownership of the pipeline – backed by up to $2-billion in further financial assurances from Alberta – gets the expansion built, Mr. Kenney doesn’t believe it has significant political implications for Alberta’s next election. Calgary pollster Janet Brown said she believes Albertans are still trying to wrap their heads around whether this week’s developments will help to get the pipeline expansion built, and it remains to be seen whether federal ownership helps Ms. Notley politically. But there’s no doubt how big the Kinder Morgan pipeline issue figures in voters’ minds. Ms. Brown said that, just three years ago, health care and education were cited in her surveys as the most pressing issues for Albertans. Early this year, the key issues are clearly the economy and the pipeline. But keeping the pipeline project alive gives some cover to Ottawa’s key ally in Western Canada, especially when it comes to the pan-Canadian climate plan. Ms. Notley has said her province will stick with the federal push to raise the national carbon price to $50 a tonne, if the pipeline is built. In contrast, the first thing Mr. Kenney would do as premier is repeal Alberta’s carbon tax. In light of that remaining uncertainty, Ms. Brown says she thought Ms. Notley’s high-fives at the legislature this week were premature, reminding her of former U.S. president George W. Bush’s infamous 2003 speech in front of a banner saying “Mission Accomplished” about the war in Iraq, which continued for years.